United States Postal Service mail contractor improves safety and operational efficiency of its 60 vehicle fleet using Samsara’s complete fleet platform. When Fernando Escolero immigrated to the US from El Salvador in 1985, he secured a job driving trucks in Fontana, California. After spending a decade hauling mail between distribution centers up and down the west coast, he saved enough money to start his own business. So in 1998, Fernando and his wife Paula Hernandez acquired two United States Postal Service (USPS) contracts to deliver mail in San Diego and San Francisco, marking the founding of Fames Transport. 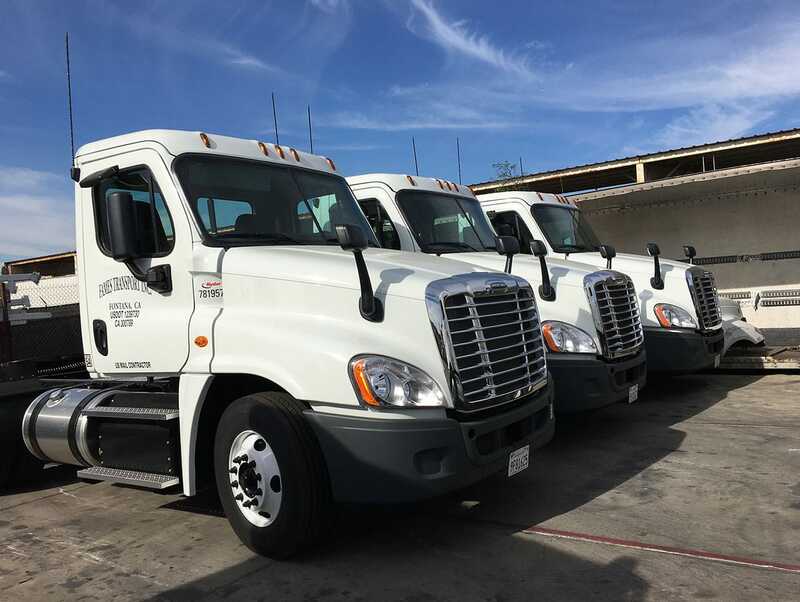 Today, the company has expanded to 60 semi-trucks operating in 20 regions across California, Nevada, Colorado, Utah, and Arizona, and the heart of the family business remains hauling mail. Fernando remains CEO and Paula acts as Vice President and CFO, but now their son Francisco has taken on much of the day-to-day operations. Committed to growing the business for generations to come and excited by the rise in e-commerce and at-home delivery, Francisco is focused on modernizing the family business to keep up with changing technology and business tools. In his new role, Francisco’s first initiative was updating Fames’ GPS tracking solution so that it would be less clunky and use less data than their existing solution. Always curious about new technologies and seeking the best value, Francisco tasked his team and family with finding a new provider as soon as their contract finished. While he had initially been drawn to the live tracking, Francisco ultimately decided to adopt Samsara because of its complete platform. In particular, he was impressed by two benefits he hadn’t anticipated: the safety improvements due to in-vehicle cameras and the operational savings in automating time sheets. When Francisco first began his free trial, he installed two VG34 Vehicle Gateways that monitored activity and location, along with safety features like harsh braking, acceleration, and speeding. When reviewing his Samsara dashboard reports, he was surprised to find that one of his drivers had a low safety score due to nearly two hours of driving above the speed limit and 40 harsh braking events. As a government contractor, safety and accident avoidance is key to winning and maintaining contracts, so this was particularly concerning to him. After sharing his finding with the Samsara team, Francisco learned that in-vehicle dashboard cameras could improve safety scores and allow managers to review harsh incidents, so he decided to install Samsara’s CM11 cameras in the same two vehicles. The driver’s safety score jumped from 79 to 97 within two weeks. “Once we installed the camera, the score skyrocketed,” said Francisco. “It’s funny - maybe it’s because the driver drives more safely, or maybe the device just gives good luck.” Francisco immediately decided to install cameras in every truck. Now Fames uses Samsara’s Safety Report to incentivize responsible driving. Fames Transport has even started a bonus program, where drivers with high ratings get a year-end bonus. Fames also uses Samsara’s safety tools to clear drivers who were unfairly blamed for accidents. “We’ve had drivers accused of hitting cars, and we’ve gotten calls from drivers saying they’ve had an accident,” said Francisco. “Now if someone calls and says ‘your driver was crossing over and almost hit me’ we have a camera to look up the actual footage.” Now when there’s an incident or someone calls with a complaint, Francisco doesn’t have to manually pull footage from the truck; he can quickly validate the truth by retrieving video from Samsara’s dashboard and provide evidence to defend his drivers. 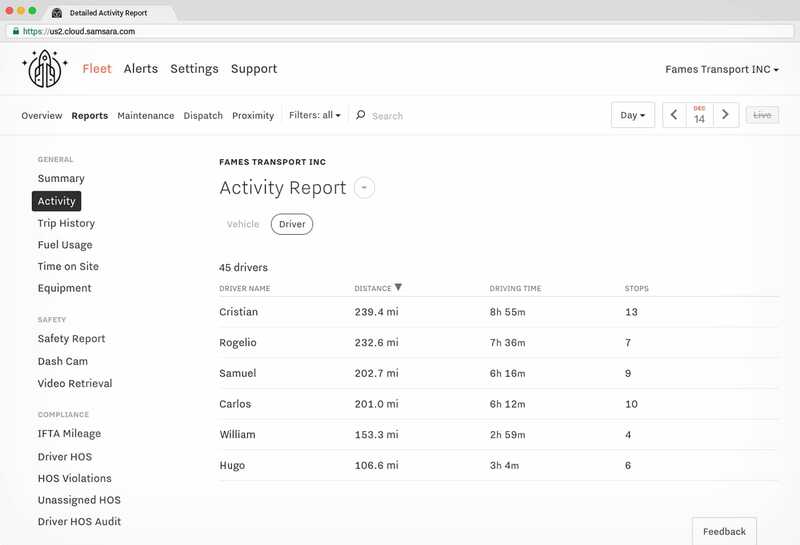 After implementing Samsara, the Fames team started using Samsara to automate the time card process by tracking driving time and mileage in the dashboard. The transition “took a lot of workload off of the employees in our office. Now they don’t have to constantly nag and remind drivers for their time cards, and it’s okay if a driver forgets to fill a time card out.” The admins now have more time to focus on other responsibilities, and Fames has gained a more efficient way to pay drivers. Tracking driver hours electronically created another unexpected benefit. Francisco realized that some drivers overstated how much they worked. “The drivers would say they worked 10 hours and turns out they were only working 8 or 9 hours,” he said. If every driver overstated their hours by just one hour per day, Francisco calculated that Fames would spend an extra half a million dollars per year on driver wages. In contrast, if drivers accidentally messed up their time cards, forgot to record an hour, or didn’t submit their record, they would lose the salary they earned. Using Samsara, Francisco has peace of mind that drivers are being fairly compensated.